Hep2O plumbing fittings – Push-fit Hepworth Hep2O includes unique features that enable quick and easy installation with a secure fitting. It is the only push-fit plumbing system with joint recognition, secure demounting and a 50 year guarantee. Hep2O plumbing fittings (pronounced Hep 2 Oh) were the first, and only demountable, Push Fit Plumbing system in Australia. The Hep2O Push fit features ease of connection and saves time in assembly. Ease of connection and reduced installation time reduce costs. 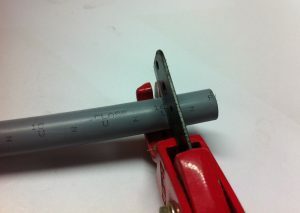 A unique feature of Hep2o is the demounting system that in a click lets to un-joint connections and make changes, saves lots of time when simple or complex changes are required. 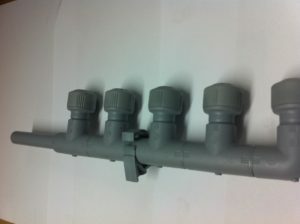 Simple Installation – Hepworth Hep2O Push Fit Plumbing System – Simply measure and cut the pipe, insert the metal sleeve in the pipe and firmly slide together using Hep2o connectors, bends, copper connectors. Connecting to existing copper or galv is made easy with polybutylene / brass adapters. Hep2O plumbing fittings including Hepworth Wavern polybutylene pipe can be used for the plumbing of hot and/or cold potable water systems in domestic or industrial applications. Pipes can be cabled into position avoiding the awkward manoeuvring associated with rigid straight lengths. The installation of Hep20 does not need heat, solders flux, or special tools, and is a ‘clean’ system, eliminating major causes of corrosion in new systems. Unbelievable flexibility – reducing number of fittings, enabling pipe to be cabled in, out and around obstacles and no need for special bending tools. Easier handling – PB Pipe is light and easy to manoeuvre even in tight spaces or overhead. Easier to join – No need for oxyacetylene, just push-fit. Corrosion Free – PB pipes do not corrode. Water hammer reduced – Due to its inherent flexibility PB pipes significantly reduce water related noises and hence a quiet and efficient plumbing system. No scale build up – PB pipes are not affected by scale or deposit build ups, higher flow rates of clean water. Why use Hep20 plumbing fittings? 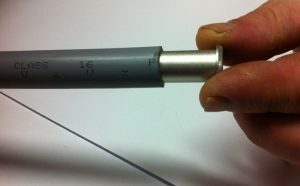 Fittings like pipe are made from polybutylene. 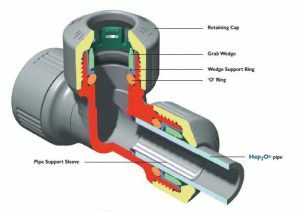 Fittings can be rotated even when under pressure. Hep₂0 is manufactured under Standards Mark Licence No. 1963 and is approved for use in all States and Territories in Australia. No need for special tools just push-fit. Approvals Hep20 is licensed by SAI Global Limited, as complying with the requirements of Australia / New Zealand Standard AS/NZS 2642.2 & 3.1994.